Small groups are made up of people who meet on a regular basis to connect relationally, grow spiritually, and serve collectively with one another. When and where do small groups meet? We offer groups that meet at various times on our church campus and off campus in homes and locations throughout the Dallas/Ft. Worth area. If you have any questions about how to get connected, please email us. What kinds of small groups are available? These groups offer natural connecting points through which members come together and form real relationships. Within these affinity categories, there are specific groups that are by age and season of life. How can I find a small group? Our list of open small groups can be searched via the small group locator, which is available throughout the year. The locator allows you to send a direct message to the leader of the group you select for that leader to contact you concerning the details of the group. 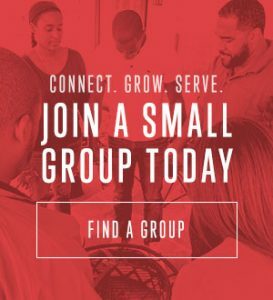 Click here to find a small group. What can I expect when I join a small group at OCBF? A minimum of two group meetings a month to connect with others, grow spiritually, and serve together in ministry. A group study and discussion of Pastor Tony Evans’ sermons or other approved curriculum for personal application. An optional third meeting once a month for fellowship, i.e., a social outing with your group in a location determined by the group. One community service project selected by your group where the good news of Jesus Christ is shared through good works. Spiritual growth, accountability, application of God’s Word and lots of fun! How do I sign up to become a small group leader? Please fill out our Small Group Leader Application and submit it to smallgroups@ocbfchurch.org. As soon as we receive your application someone from our small group team will contact you about next steps. Is childcare available during the small group meeting times? On-campus groups do offer childcare options. Off campus groups make their own arrangements for childcare based on the priorities of each group.